Kings Of Leon rocked the Pyramid Stage at Glastonbury. Trust us, we were there. 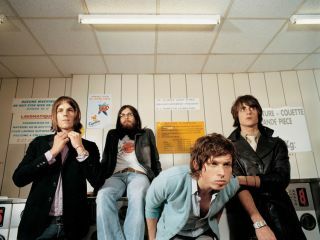 With album number four on its way on 22 September 2008, fans hungry for a taster of Only By The Night can download new track Crawl for free, right now. The band's Glastonbury set opener back in June, Crawl is a fuzz bass driven groover and easily the southern fried rockers' most politicised work to date. Click here for your free download, available for a limited time only. For more hints of what to expect from Only By The Night, check out this video clip compiled from footage of the studio sessions. Fans of indie-rock Americana should also check out Bright Eyes star Conor Oberst's forthcoming eponymous album, streaming in its entirety from the Conor Oberst And The Mystic Valley Band website right now.